During the Leicester City vs Manchester United game on Saturday night, commentator Alan Parry mentioned the “stresses and strains” on the Premier League players at having to play four games over the Christmas period. “Some of these players face four games in just nine day!” Parry remarked as if this was a massive hardship for them. That will be the same four games in nine days that virtually every club playing at Steps 7 and 8 of the footballing pyramid face over Christmas. I hear the arguments about the stresses and strains of the Premier League, apparently the fastest league in the world (although I am not sure how that has been measured) but these players are professional. They have the best facilities for fitness and recovery at their disposal – Pep Guardiola’s 16 man management team includes such roles as a Sports Therapist, a Head of Human Performance, a Soft Tissue Therapist and a Head of Sports Medicine. Below them is an army of experts whose job is to ensure that Pep’s record breaking team are in peak condition when they cross the white line. In most instances they are told what to eat and drink, when and where. 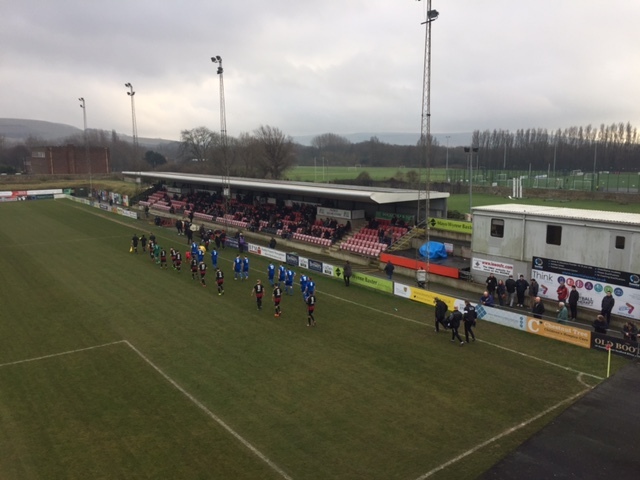 Down in the Bostik League South (as with in most other Non-Leagues), today was the first of four games Lewes played in the next nine days. Our players and physios head home to their families tonight for Christmas and some will return to their normal jobs tomorrow and even Christmas Day before regrouping on Tuesday for the next game meaning that they cannot spend any time with the players and their rehabilitation. We share the same concern as Guardiola that four games over the Christmas period is too much, especially with small squads and half way through the season where suspensions are starting to bite. Today was our 33rd game of the season, and whilst our three new signings who all made their debuts today due to the growing injury list took the number of players we have used over the 30 mark, only 20 have played in more than five games, exactly the same number of players Manchester City have used in their 28 games this season. Ultimately, the commercialisation of the Premier League game means that clubs have little control as to when games are scheduled. Whilst other leagues across Europe have mid-Winter breaks, that simply means the Premier League can charge a higher fee to overseas broadcasters to schedule games at times attractive to foreign audiences – why else would the Leicester City game be scheduled on a Saturday night two days before Christmas? 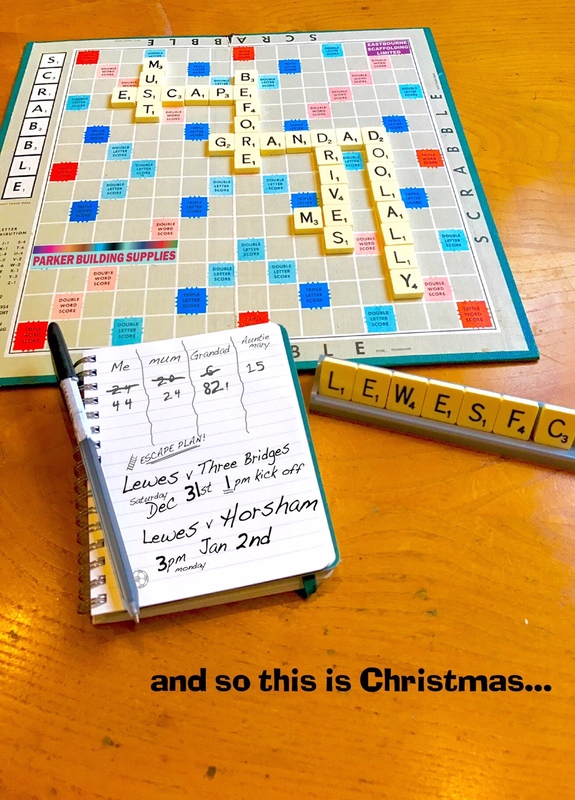 In the Non-Leagues Christmas games bring in vital revenue, with local derbies boosting attendances although the continued lack of public transport on Boxing Day does prove problematic to many – Lewes take on Hastings United on Boxing Day despite the fact there is no public transport running between the two East Sussex towns 29 miles apart. Commentators and members of the media often talk about Premier League players in revered terms, forgetting the hundreds of other equally committed and passionate individuals give up their time to bring joy to thousands of us who prefer our football a little less sanitised than that at the top level. Happy Christmas to everyone who will take part in those games over the next nine days and spread the joy of the beautiful game to us all. It has been awhile since I have filed a match report on these hallowed digital pages. A combination of not having much more to say about the mighty Rooks that the world and his various wives have not read elsewhere, a duty of care in my positions on various boards of directors meaning I can no longer say anything bad/mean/defamatory/blatantly untrue about anyone in the game south of the M6 and only writing about my overseas visits in the next chapter of The Football Tourist (@OckleyBooks), due for publication in 2018. It is even rarer these days that I miss a Rooks game other than when I am posted somewhere around the world for work. But sometimes even the most ardent fan has to put family before football and today was one of those days. Two months ago when I agreed to take Lolly, my eldest daughter, up to Leeds (Leeds, Leeds) to look at the University campus I had no idea we would still be playing in the FA Trophy. Our national cup competitions are normally done and dusted by mid-October, falling less than heroically to a side from a lower division. 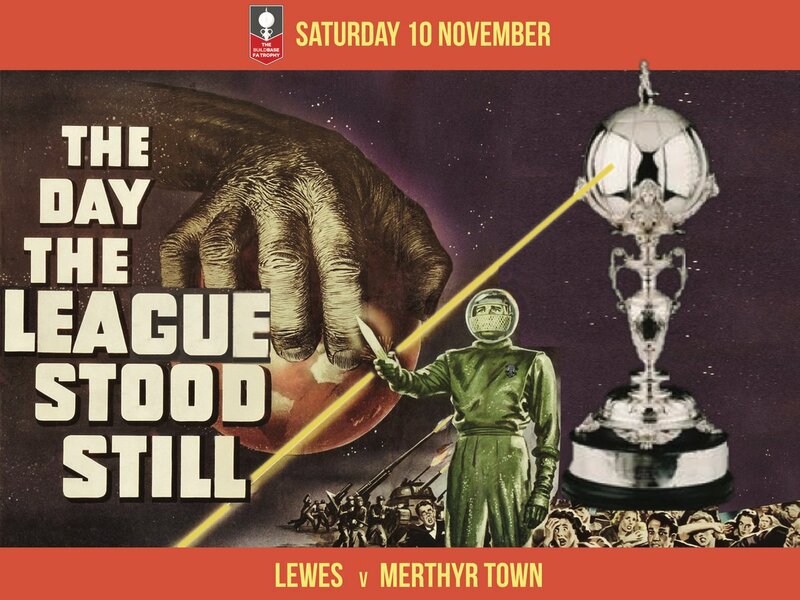 But Lewes 2017 are made of stronger stuff and wins over East Grinstead Town, Dunstable Town and Bishop’s Stortford (the last two playing a division higher than us no less) had seen us progress through to the Final Qualifying Round – a stage of the competition we last played at in 2014 when we conceded five first half goals away at Oxford City to crash out. We gathered round the laptop a few weeks ago, pressing F5 on the FA’s Twitter feed waiting to hear who we would be playing. Technically, Leeds is actually closer to Lewes than Truro by a few miles which just goes to show how crazy the geographical split of the Non-League system is. But that wouldn’t help me in the slightest, meaning that I would miss one of our biggest home games in years. I’d done the dutiful thing and gone to watch Truro City on Tuesday night as they made another 700 mile round trip for a National League South game, albeit it one that could have taken them top of the table and meant that we could not have possibly drawn a higher ranked team in this round of the competition. Scouting report filed with our management team and back of quinoa packet drawing complete of how I would exploit their deep-sitting 5-3-2 formation, I could concentrate on where I would get my football fix on Saturday afternoon, post University visit, and as Lolly suggested, write something for my blog so that she could show her Maths teacher. 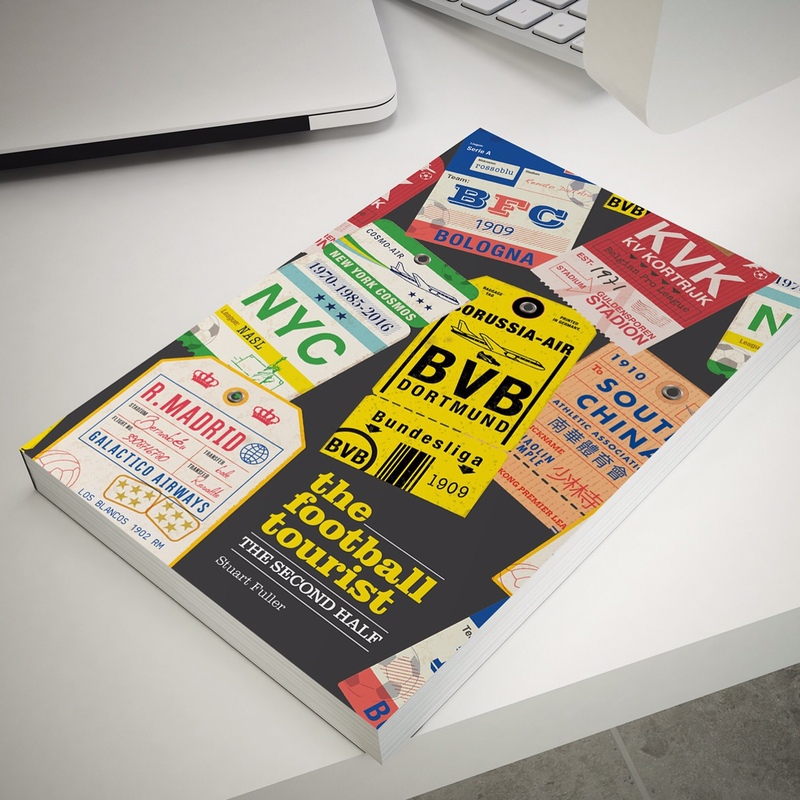 Apparently my last piece, “PSYCHOLOGY THEORY EXPLAINED BY FOOTBALL – 1. EXISTENTIALISM“, was a bit pretentious for his liking. My source of inspiration was my publisher, and good friend, David Hartrick who quickly drew up a short-list of games which were a) on my way home to London, b) that I’d never been to before, c) had a bit of a story behind and d) served chips with gravy. Point d) was definitely the deal breaker but the lad did good when he emailed the results of his extensive research (that’s what his invoice suggested anyway) and said we would be heading to the town of Stocksbridge, home to around 10,000 people, experimental rock group Rolo Tomassi and a football club with a pedigree of England Internationals. 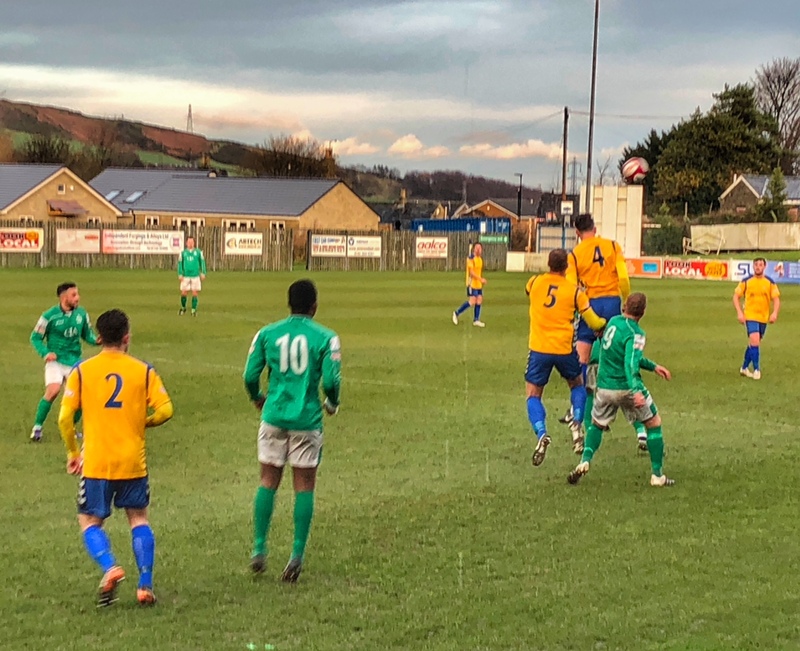 Stocksbridge Park Steels Football Club came into existence in 1986 as a result of the merger of Stocksbridge Works, the team from the local steel plant, and Oxley Park Sports. 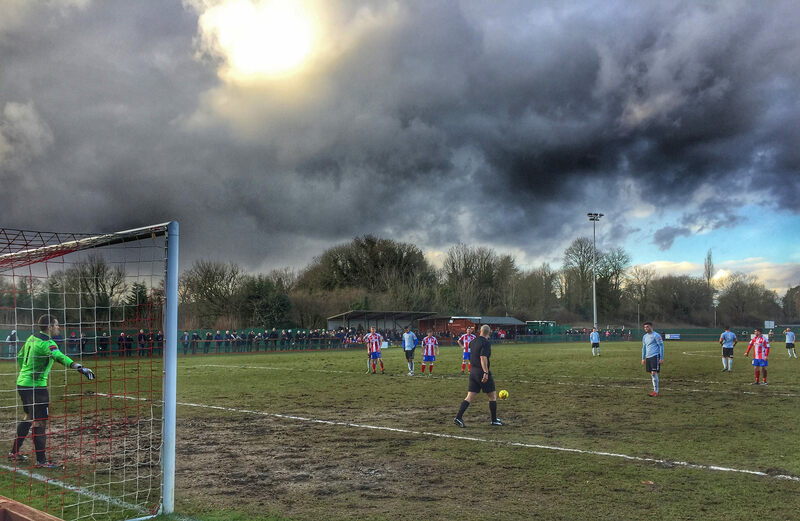 Their place in Non-League folklore has been cemented by five footballing facts, which to those from these parts will be as dull as dishwater but to us Southerners, are the stuff of legends. Fact number 1 – In August 2002 the club beat Oldham Town in the FA Cup Preliminary Round 17-1. Striker Paul Jackson claimed 3 match balls, almost bankrupting the club after his record goal scoring haul of 10 goals in that game, a record that still stands today. Fact number 2 – With 22 different sides below the senior team, the club are recognised as the biggest community club in South Yorkshire. Fact number 3 – In 2002, former England international Chris Waddle joined the club and played one game for them at the age of 42 years old. Also at the same age, relegation specialist and king of the Yorkshire clubs, Neil Redfearn joined the club. Fact number 4 – The ground only has 3 sides, with the fourth being a fence, albeit a nice wooden one. It sits on top of a hill, with oxygen needed for those making the journey up the hill from the town centre. Fact number 5 – A certain Jamie Vardy started his career off at Bracken Moor, after being released by Sheffield Wednesday at the age of sixteen. Vardy spent seven seasons at the club, three in the senior squad on a reputed £30 a week before joining Halifax Town. He scored 54 goals (all listed in the match programme) including a remarkable three-minute hatrick in the FA Trophy game against Mossley back in October 2008. Two weeks previous he had scored a six-minute treble against Grantham Town. The club is understandably proud of the association with the England international, naming their main stand in his honour. 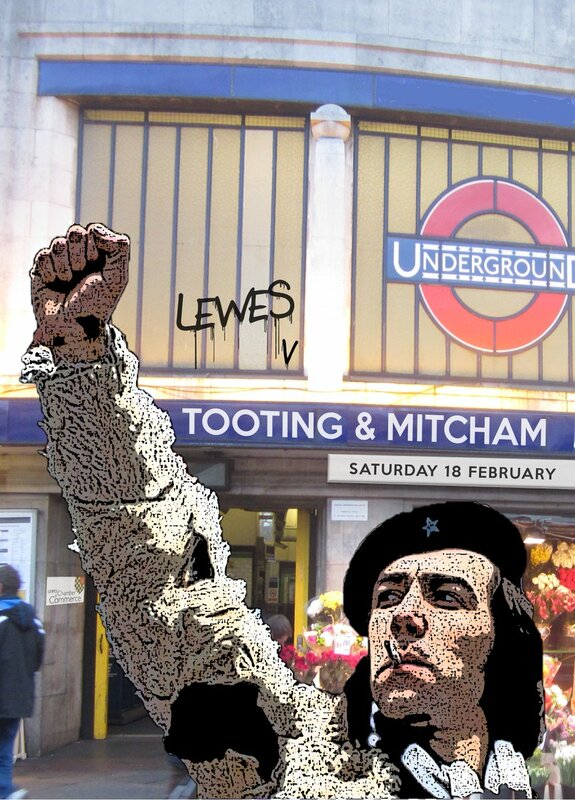 Today, the club play in the 8th tier of English football, like Lewes and are challenging for one of the two promotion places into the Premier League (Evostik rather than the sticker Bostik version), like Lewes and part of my interest in this game would be to understand how different life up here was compared to down south. Whilst I would be watching most of the action with one eye on events 242 miles due south, it would be good to catch up with Dave and listen to his enthralling stories that would undoubtedly involve snooker, Marvel comics and another one of his hatricks in five-a-side (for those who don’t know, Dave has a block booking at the Goals centre in Huddersfield on a Thursday night at 10pm where he is the only player and consequently, the top scorer in the league). We parked up outside the turnstiles just as the snow started, giving the ground a magical look and feel. I’d literally taken two steps in the ground before being ushered into the boardroom and had a cup of tea thrust in my hand. 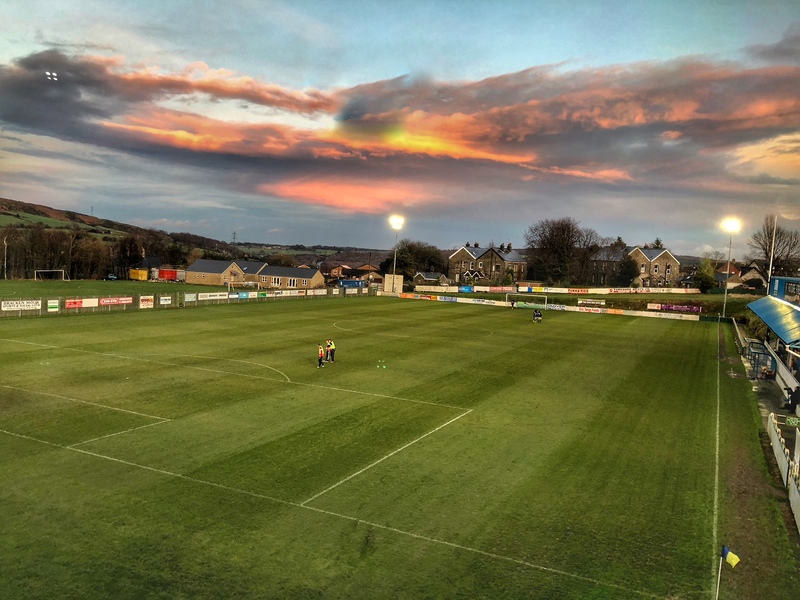 The power of Social Media had meant my impending arrival had been announced and I spent ten minutes discussing the various merits of our clubs and leagues with Stocksbridge Park Steels Commercial Manager Roger Gissing. 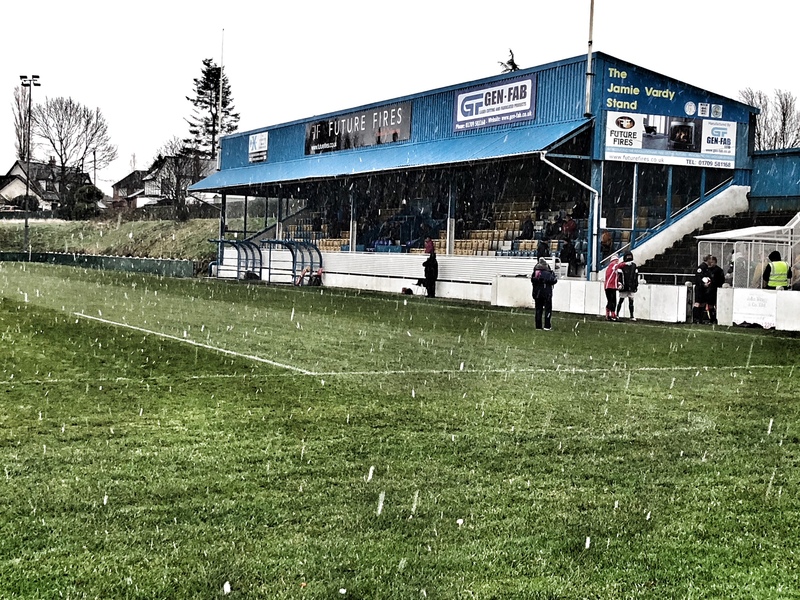 With around a hundred hardy souls taking their place in the stand, sheltering from the biting wind and flurries of snow, Roger explained the club’s (and the league’s) issues. They faced a huge struggle to attract fans, averaging around 110 this season or about 1% of the town’s population. Sitting just 10 miles from Sheffield and 30 miles each from Manchester and Leeds, football fans in these parts head off to the glitz and glamour of the Premier League and Championship most Saturday’s rather than supporting their local team. They have a thriving juniors section and community programme but come 3pm on a Saturday many of those kids are nowhere to be seen. Despite offering the cheapest admission in the league, at just £7 and the club once again doing well, it seemed that the X-factor in getting people to watch the game was still missing. I have no idea why as even before the game had kicked off I was struck with how fantastic the club was. Everyone to a (wo)man was friendly, the set up of the club with its quirky stands and fantastic warm bar, offering a bird’s-eye view of the action. Fifteen pounds got Lolly and I admission, a programme, a pint and a coke and a large sausage roll. Add on top the potential to see a cracking game of football and you have a fantastic value afternoon. The club also face issues with how the geographical split of the league has been made and something that is a real concern with a further restructure due at the end of the season. 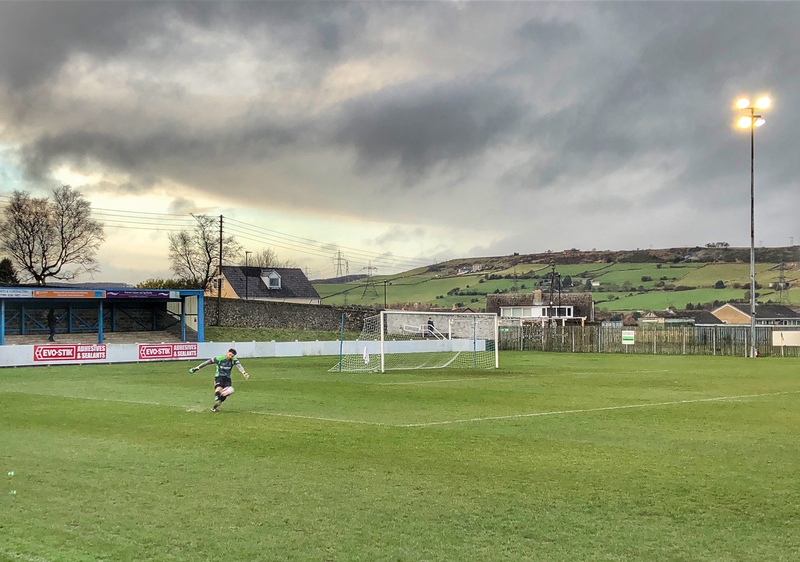 Their shortest journey is to Sheffield FC, 21 miles away yet the two Ossett clubs, who play in the North Division, are around the same distance away. Rather make those short journeys, they have away trips to Peterborough Sports, Alvechurch, Market Drayton Town and Corby Town, all 200 mile plus round trips. However, they were once again challenging towards the top of the table and a win over Loughborough Dynamo (named after the great Dynamo Moscow should you want to know) then they could climb up to 2nd place and into the automatic promotion places behind runaway leaders Basford United. In terms of value for money, you cannot complain about a seven-goal thriller, with a last-minute winner. Except we didn’t realise it was a) a seven-goal thriller or b) there was a last-minute winner. In fact, we missed four of the seven goals through a variety of reasons. As the teams emerged down the steep steps and into the mini-blizzard, we finished up our cup of tea in the boardroom, zipped up the coats and made our way outside. As I did the gentlemanly thing and held the door open for a lady coming in, the home side scored. Fifteen seconds had elapsed since I put down my cup but in that time the home side and won a free-kick 30 yards out. Jack Poulton sent his ball into the box and it fooled everyone and ended up in the back of the net. 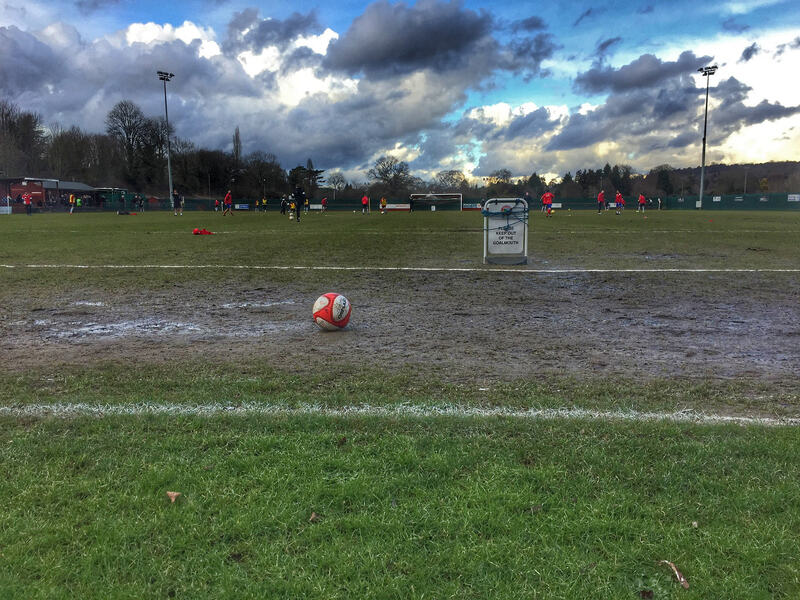 The game was a relatively cagey affair, with both sides trying to make the best of the conditions. Just as the referee was about to blow for half-time the home side grabbed a second as Matt Reay’s shot eluded everyone and trickled into the corner. We took refuge from the cold in the bar, which positioned in the corner of the ground and on the first floor, offered outstanding views of the action. Unsurprisingly, the window seats were at a premium – why wouldn’t they with Bracken Moor Smooth on draft and Jeff Stelling updating everyone in the corner (not literally Jeff). The second half was about six minutes old when we headed downstairs, stopping for a toilet break. I heard a muffled cheer whilst I was in there but thought nothing more of it. The tide seemed to be turning and the visitors grabbed a couple of goals through Riley to level the scores (at this point we assumed it was 2-2). The final fifteen minutes were as action-filled as you could ever hope to see. Bodies were being thrown on the line at both ends to keep efforts out and there was a real cup tie feel about the game with both sides wanting a winner. However, it was the home side who prevailed, scoring in the first minute of four in injury time when Litchfield bundled in from close range after the mother of all scrambles. We ducked into the boardroom, thanked our hosts for their hospitality and started our long journey south, still in complete ignorance of the two goals, one for each side we missed on our comfort break in the second half. I’d urge any fan of football, whether they lived in South Yorkshire or not, to make a trip to visit this wonderful club. Like hundreds of others up and down the land, they survive thanks to the efforts of their volunteers rather than the numbers that come through the turnstile. If ten percent of the regular fans who go to Bramall Lane and Hillsborough came to watch just one game a season at Bracken Moor it would more than double their average attendance. And that, could be the difference between having a community club for years to come or not. Growing up I pleaded with my Dad to buy every house we saw for sale on our walk from the car parked near Plaistow tube station to The Boleyn Ground. Wouldn’t it be brilliant to live next to a football ground? I used to believe that the players spent every waking hour at the ground and probably would be a neighbour when we moved it. I couldn’t understand his reluctance to give up our nice house in the country with a big garden for a terrace house on Green Street with a sofa in the front yard. As the years have passed my interest in living so close waned as I saw exactly what fans did in the front gardens of the houses near grounds. Of course the players didn’t live anywhere near the ground or even the fans, shudder the thought of having to mix with them. But the idea of being able to nip out of the door at 2:55pm and be back in time for the distinct sounds of Sports Report is somewhat appealing. Whenever I travel to games overseas I always try to stay close to the stadium, not having to worry about public transport post match. 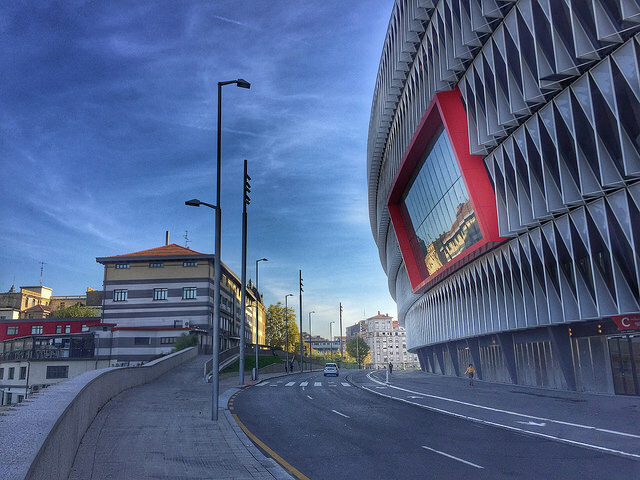 I also love the idea of waking up, opening the curtains and seeing a stadium there in front of me, as I did in Bilbao back in November when I was almost in touching distance of the beautiful San Mames stadium. Whilst it wasn’t quite in touching distance, the away trip to Greenwich Borough was one I had been looking forward to because I didn’t have to rely on any public transport or any need to drive or be driven (in the end I did use public transport and I did get a lift home) as their home ground in Middle Park Avenue was just 1.6 miles away, and with the Park Tavern at the half-way point, the meeting point for the extended Lewes Lunatic Fringe. The Park Tavern is my local, despite being a mile away (we are bereft of pubs bizarrely in this area of London) and it was confirmed that we were the largest away support they had ever seen, although our only competition was the three Belgium fans who had got off the train at Mottingham just down the road thinking it was Nottingham and were looking for the City Ground apparently. 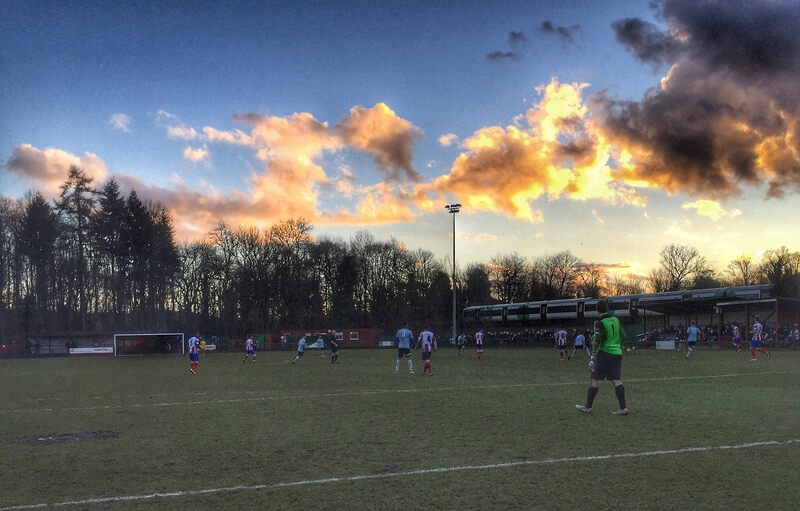 In a week where finances in Non-League football have come under the spotlight again with the crazy situation taking another turn for the ridiculous at Billericay Town, we headed down to Greenwich Borough. It’s very hard to find out the real numbers behind virtually every club at our level and whilst we are completely transparent in publishing our budget, we still get questions from other clubs saying “but that’s not your real budget though is it?” And our answer is always the same, “yep” although of course the number we publish is the gross number, not the net one. Greenwich Borough’s entry into the Isthmian League and the investment in Gary Alexander’s squad has led to many speculating that they are the best funded squad in the league, with former Football League players such as Peter Sweeney, Bradley Pritchard, Charlie MacDonald and Glenn Wilson. Expectations are therefore high down at The DGS Marine Stadium (named after the Chairman’s shipping business) and they will be seething at the fact they let top spot slip through their fingers in the Autumn, although they’ve never fallen out of the Play-off spaces since. Fifteen minutes before kick-off with our formation and tactics sorted, captain Lloyd Cotton put his foot down a divot on the warm-up pitch. His presence at the back cannot be underestimated. In the 19 games he has played centre-back this season, we had won 13 and drawn 3. Fortunately we had Stacey Freeman on the bench to come into the side at the eleventh hour, albeit carrying an injury himself. With the sun shining, the Rooks took to the field hoping that they would put in a South Park rather than a Godalming Town performance and move level on points with our hosts. 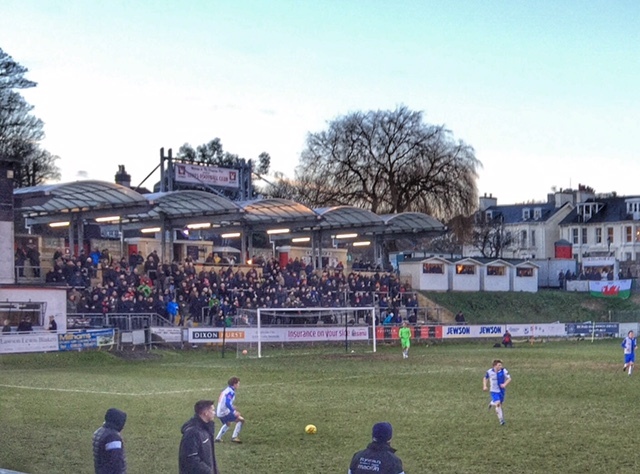 In the end this game was decided by two poor decisions, one made by Lewes’s Jack Dixon and one made by the referee. 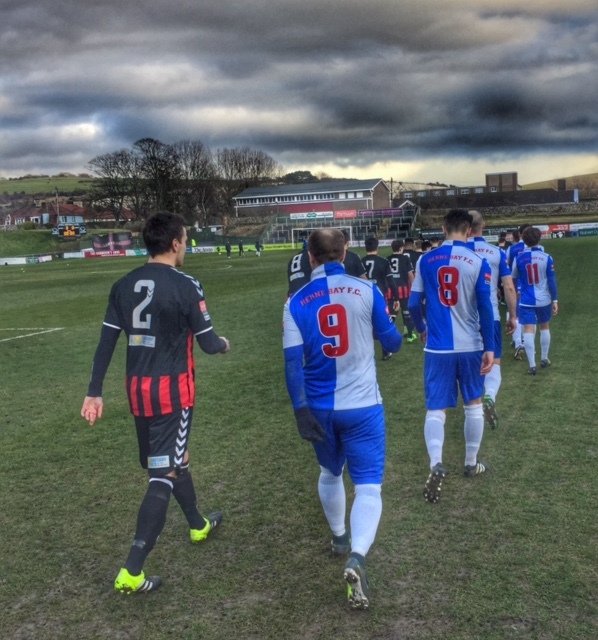 Third versus fifth and there was very to choose between the two sides at the start but by 5pm there was six points and four places – the difference between having a shot at promotion come end of April and a summer licking our wounds. Football should always be enjoyed in the sunshine with a beer but in the first twenty minutes there was very little action on the pitch. Both sides were cancelling themselves in midfield and with the Rooks battling both with the uphill slope and the strong wind in their face, they were happy to restrict the hosts to shots from distance. Then in the space of a minute we went from attacking a corner to picking the ball out of the net. It essentially went like this. Sow corner to far post, Freeman jumps and is penalised. Holloway takes free-kick, the bounce beats Harrington but Dixon is there to clear danger. He under-hits his back pass to Winterton and Charlie MacDonald gets in front of Stacey Freeman and drills it past the Lewes keeper. It was OK though as we would have the conditions in our favour in the second half. The second period was dominated in my eyes by two events. Firstly the wind blew over my 1/2 full pint of Badger’s Bitter and then Stephen Okoh was blatantly taken out in the area and the referee turned a blind eye. There was no doubt that the first incident was an accident but the second was as clear a penalty as you could ever ask for. On many other occasions we would have been celebrating a spot kick but that’s football for you. Okoh then hit the bar with ten to play but that was the closest we came to scoring. At the other end Winterton was rarely troubled as Greenwich Borough professionally saw the game out to grab all three points. The disappointment wasn’t in the manner we lost – there was very little between the two sides – but in the fact every other team challenging with us for the Play-offs won. We’d gone from fourth to seventh in the space of six days. But with games coming thick and fast against 9th, 6th, 5th and 4th in the table to come in the next three weeks, nobody was giving up. I could have walked home, smug that I had not added anything to my carbon footprint but Baz offered me a lift. Just like living next to a ground seems like a great idea, turning down a lift to walk home was the sensible option. 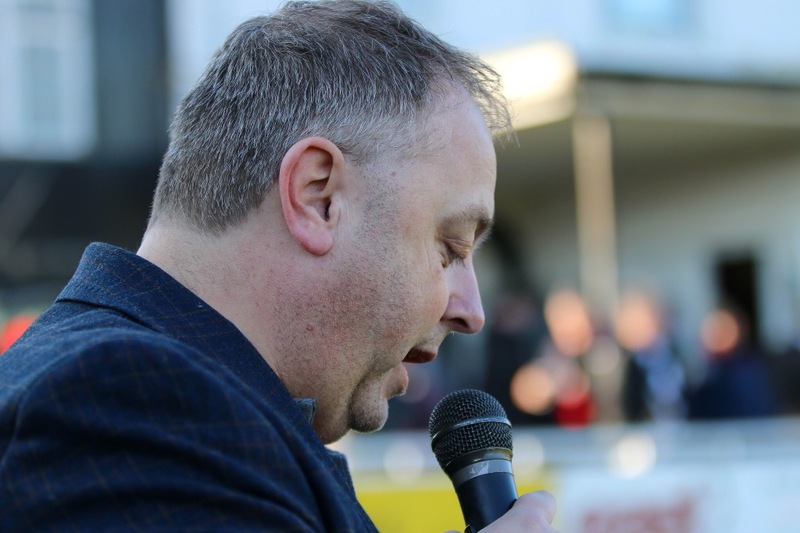 More through necessity than anything else, I still have the pleasure of holding the microphone at The Dripping Pan for every home game I attend. Whilst the job isn’t that hard, you are forced to pay a little more attention than most fans to what is going on on the field, and such luxuries as having a pee, eating anything that requires two hands or even tweeting add an extra layer of complexity to the job. It is a thankless, mostly dull job really but one that is essential. In the three years that I’ve been doing the job I have had to deal with two lost children, five lost wallets, numerous cars blocking access in the car park and one request to “ring home”. Alas, I am still waiting for my first marriage proposal or the nadir of a PA announcers career, “Mr x just to let you know you are the father of a new baby boy/girl”. When I agreed to take it on I wanted to do it my way. No sitting up in the stand, no cheesy announcements, no muffled voices. It had to be big and bold, whilst still standing on the terraces with a pint of Harveys. Of course this leads to problems, especially when I can’t get to the bar until we have kicked off and am scared to turn my back just for a second in case I miss a bit of action. I should do my research on pronunciation of player names but rarely do (apparently I’m still pronouncing Gus Sow’s name wrong), breaking it down phonetically and hoping I’ve got it right. You can get too cocky though and announce something without referring to the team sheet such as the announcement of Tooting’s fourth goal scorer yesterday, Adam Cunningham….for Adam read Alexander. Standing on the terraces does have issues though – it’s not that easy to see what’s going on at the other end. I’ve lost count the number of times an opponent has scored and we have no idea who got the final touch. In games when the reliable Rookmeister isn’t Tweeting in the stands I have to make a brave decision, knowing that the name I pick will be added to Football Web Pages and go down in history. Of course we can try to find out from the opposing keeper, but they rarely know or even bother to respond. And then there are times when you simply forget that you are doing the job as was the case yesterday when we conceded the comical second goal. We were all so confused as to what happened that it was a good five minutes later before I remembered that I hadn’t announced it, although the handling of an own-goal is always a difficult one to decide what to do. Should I say “own goal by Lewes number 4 Lloyd Harrington”, adding fuel to the fire of an already fuming midfielder, or should I give it to the “supplier” of the final ball? In this case the Tooting player could hardly claim any credit for it. Perhaps simply not announcing it was the best option, although if it was the first goal, what should I have done then as the Golden Goal competition is resting on my announcement of the time. During the second half I bumped into an old friend, Gary Hancock, down from Tooting and started chatting to him, only realising a few minutes later than both sides had brought on substitutes unannounced. Now that’s one aspect where I have the power of life or death. Well, sort of. Yesterday we sold out of Golden Goal tickets meaning that two lucky punters would win £25. I’m a bit conflicted here as I always have two tickets although I never open them until the first goal has been scored and I’ve announced the winner – I’m sure there would be a stewards enquiry if I did ever win, despite spending a King’s ransom on it over the years. Announcing the teams is a challenge in itself. They don’t put pronunciation guides on team sheets these days – was Tooting’s left-back “Ade-bow-ale”, “Ad-ebo-wale” or “Ade-bowal-e”? The temptation to adopt Alan Partridge-style exclamations has so far been suppressed but it is only a matter of time before one or two slip out. 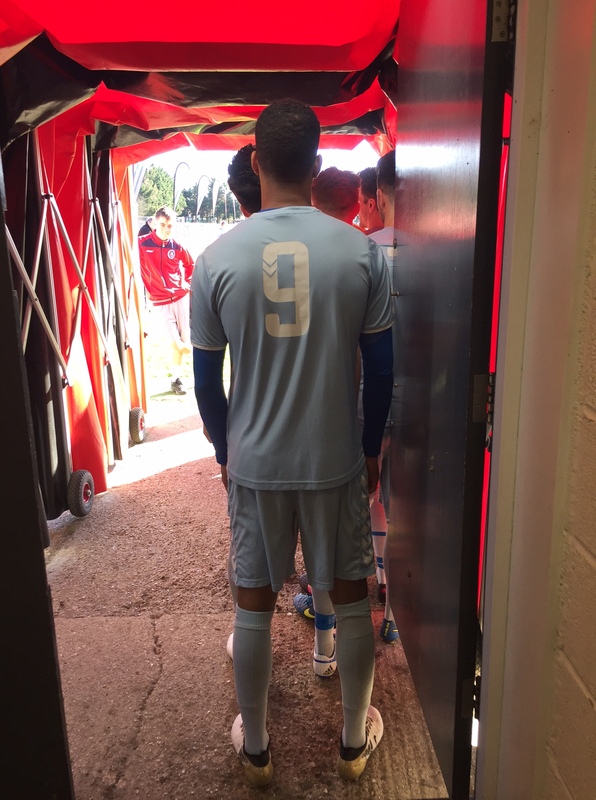 The rules keep on coming – Don’t announce the man of the match or official attendance too early – my rule is during a stop in play once we get into the 89th minute. Three years ago versus Brighton & Hove Albion in the Sussex Senior Cup, Sam Crabb was chosen and I announced the award when we were 1-0 down but then two Tom Davis specials saw us win and would’ve had won him the award. Yesterday there was an audible groan when I announced Charlie Coppola as Man of the Match, with comments like “you sure?” and “what game are you watching?” but I don’t choose the winner, I just announce it. And finally you need to thank the away fans for attending, even if they’ve smashed up half the ground and invaded the pitch, and wish them luck for rest of season and a safe journey home. Yesterday I made the “mistake” of suggesting we would see the Tooting & Mitcham United fans next season despite them sitting proudly on top of the table. Or was it a mistake? Let’s start with the positives. Our matchday poster got national media attention. 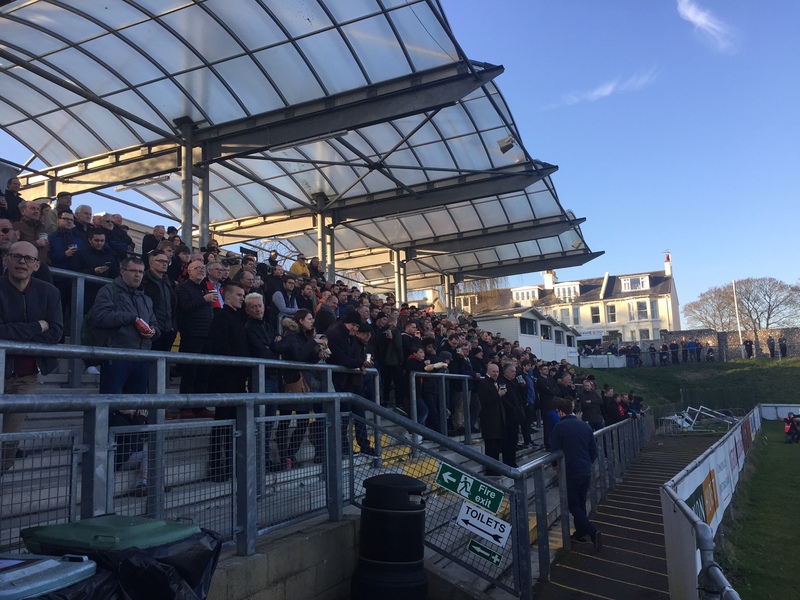 We scored the best goal of the game and the crowd of 769 was the second biggest in the Ryman League South this season and the third biggest at step 3 and 4. Reasons to be cheerful 1, 2 and 3? Alas the 5-1 scoreline where we actively contributed to four of the goals didn’t make for a happy post-match analysis. It could have been so different as we should have taken the lead inside the first two minutes, as Charlie Coppola found Jonté Smith in space in the penalty area, only for the striker to see his initial strike and then his effort on the rebound saved by Kyle Merson in the Tooting goal. Then the roles were reversed and we almost saw a Coppola headed goal as he got his head to Smith’s excellent cross. Alas, we couldn’t take our chances and fell behind in the 26 minutes when Chace O’Neill cut inside from the right and saw his long-range effort appear to take a deflection and loop over Winterton into the top corner. Tooting’s lead was doubled in bizarre circumstances nine minutes later, as Winterton called for the ball as he looked to claim a cross from the right, with Lloyd Harrington ducking to get out of the goalkeeper’s way, only for the ball to hit him on the back and end up in the back of the net. We needed to score the next goal and started the second half positively but when chances presented themselves we couldn’t quite find the final touch. 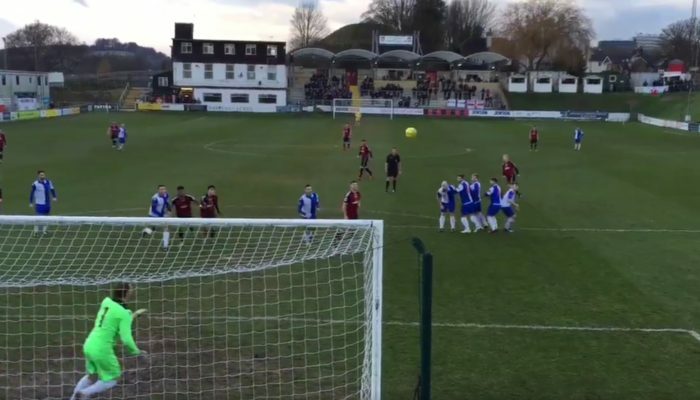 On the hour mark Stacey Freeman fouled Mike Dixon in the area and former Lewes player Jordan Wilson sent Winterton the wrong way from the spot to make it 3-0 and effectively end any hope of a come-back. Tooting increased their lead further with ten minutes remaining, as substitute Adam/Alexander Cunningham capitalised on hesitant defending to run through and finish past Winterton. The afternoon went from bad to worse four minutes later, as Lloyd Cotton was shown a straight red card for hauling down Dixon in the penalty area as the striker looked to get his shot away with only Winterton to beat. Wilson was pushed aside with Dunn desperate to score his first goal since returning from Greenwich Borough and he chipped the ball down the middle to make it 5-0. Despite a small exodus of fans when that goal went in, the biggest cheer of the day came when Stephen Okoh danced through the visitors defence and rolled the ball through Merson’s legs to give us some consolation. It was certainly a kick in the teeth but other results mean that a win on Wednesday against Dorking Wanderers (only!) could still see us rise to fourth place, our highest league position this season. We’ve got a relatively settled routine as to how we prepare for home games. At around 2.15pm (for a 3pm kick off) we will get the first sight of the opposition’s starting XI and from that moment we will start to compare their line up to their previous game, or one that we have got a scouting report on. In the next ten minutes alterations will be made to our formation, tactics and set-pieces, to try to exploit any weaknesses. Of course, our approach isn’t unique and our opponents will be more than likely doing exactly the same downstairs in their changing room. Whilst no one will ever confess to games being won off the pitch, the importance of preparation cannot be under estimated even at our level. Yesterday the preparations and execution were slightly different. Having played our visitors just four days previously meant we knew a fair bit about them. It’s fair to say that we spent some of the time on Tuesday watching how they played rather than our own performance in preparation for today. Few teams set themselves up the same when they travel away. Alas, with a threadbare squad at the moment, we don’t have much choice. Injuries to Matthew George and Ronnie Conlon further depleted our squad yesterday but we have a talented group of youngsters such as Dean Stewart-Hunter who came into the side. The notable change in our visitors line up was the return of keeper Jack Delo, who had been injured in the warm up. Even knowing what the injury was enabled us to have a plan to try to exploit that weakness. Our visitors “secret weapon” on Tuesday was their huge long-throws which when they first started taking them, surprised us. So the key to this game was don’t concede throw-ins in the final third. If in doubt, concede a corner or simply clear it in-field. If we did concede one, then bear in mind they would be likely to throw the first couple short to surprise us. The second complicating issue for this game was that Darren would be serving a one-game touchline ban relating to his dismissal back in October against Cray Wanderers. He’d entered the field of play after a Cray player had assaulted Lloyd Cotton and subsequently been red-carded. We could of course appeal against the charge but would need to submit evidence to the contrary of the match officials. Lose the appeal and the fine (£100), and the ban (1 game) could be significantly worse. So Darren took his punishment and headed to the stands. But how could we ensure he would be manager seen and not heard? Simple – I would sit next to him and make sure he served his ban. So the “runner” would be me, passing notes down to the dugout. Not quite the normal afternoon of watching the game for me then. The first instruction is written down and is given to me. As I head down the steps to tell Ross that James Hammond should take the free-kick, I can hear Darren shout “Get ‘Ammo to take it..” Hammond does indeed take the free-kick and he curls it perfectly into the top corner to give us a 1-0 lead. It’s going to be a long afternoon. Thirty seconds later Stephen Okoh races clear of the Herne Bay defence and lobs the ball over the keeper…as the ball is in the air I feel a grab on my arm. Could it be two? No, the ball shaved the post and goes wide. Notes are furiously written by Darren as he sees things I can’t see. “Win the ball faster” he shouts at nobody, but Codge hears him, translating his message into a quiet word in the ear of Lloyd Harrington as he comes over to take a throw-in. On the twenty minute mark, the Vice-Chairman of the Isthmian League sits directly behind Darren. I write on a note that he is sitting behind him, but Daz is too engrossed in the game, concerned that Jack Dixon is sitting on the ball too long. He races off at the half-time whistle, trying to get into the dressing room before the players, ready to give his full and frank opinion on why we aren’t more than one goal ahead. Less than two minutes into the second half Dixon fouls his marker, picks up a yellow card which will see him banned for two more games (having just come back from a two game suspension) and the referee points to the spot. On Tuesday night Adria pulled off a superb save from Pulman’s spot kick. Today it is Walder who steps up and slots it into the corner. Somehow we are level. “We’re flat and that’s making the crowd flat” I text Deaksy and tell him to start singing. The written messages soon dry up, replaced by my phone being used as a walkie-talkie with Ross on the touchline. James Hammond restores our lead with a tap-in after the impressive Kaja roasts his man down the right and tees him up. Then the crowd start making some noise and we start dominating play. Lloyd Harrington picks up a yellow, meaning he will also miss the two vital games against Dorking Wanderers. “Looks like I’m going to have to play in those games”. I assume he’s joking although when Charlie Coppola neatly flicks the ball round his marker, Darren tells me the England Schoolboys international learnt that trick from him in training and I can see the seriousness in his eyes. We huff and puff and finally blow the Herne Bay resistence down with a third in injury time, Egli Kaja (the first ever Albanian to play for Lewes for those who love a random fact) beats his man and is then hauled down. A mele breaks out as four or five Rooks players want to take the spot-kick. Jack Dixon wins the discussion and slots home. Job well done all round. I could now have a beer and relax, around two hours later than I normally could. Three wins on the bounce, scoring nine times and conceding just twice means that we rise to 5th in the table, the highest we have been since the opening day win at Chipstead. Which technically meant when the officials came into the bar for their pasta post-match, Darren couldn’t even go and shake their hand and say “well done” although he resisted passing me any further notes. Normal service will be resumed in two weeks time thankfully. What happens when you get a bit lippy and suggest to one of your colleagues that their job on a match day was “easy”? It seemed I was just about to find out the hard way as our beloved club secretary Barry was heading off on a business trip 24 hours prior to our final game of 2016. To make matters worse, we also had no kit man for the game. 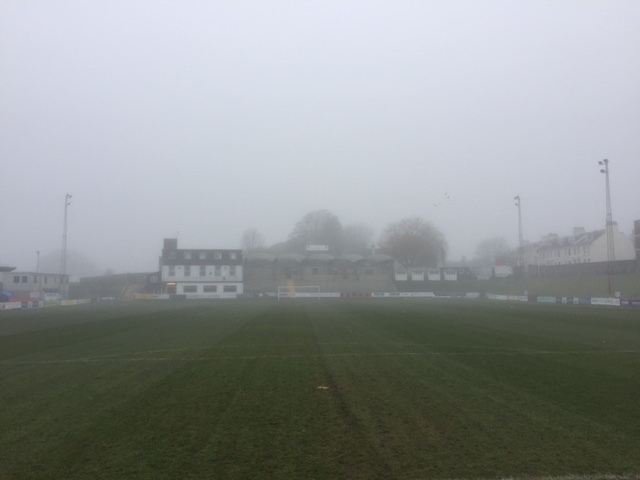 First rule behind the scenes in Non-League football is “Be prepared to do it yourself” which is why I was wandering into the Dripping Pan four hours before kick off against Three Bridges with a bag full of assorted sock tape. Lay the kit out, pump up a few balls, write out the team sheet and shake hands with the referee right? What’s so difficult about that? Alas, it if was that simple I would have been enjoying a beer or two an hour before the game rather than worriedly looking for instructions about how to use Football Web Pages live system and trying to find the season ticket list for Gate 3. The first issue on arrival was the fog. The previous evening has seen the game at The Amex postponed due to it and it appeared that overnight the problem hadn’t got much better in these parts. There was not a lot I could do about that bar man the phones and let people know that I could see both goals from the office and we “should” be OK for 1pm. 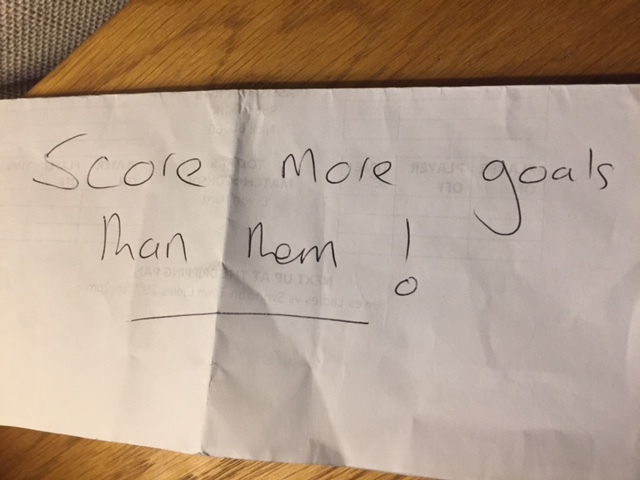 Before Barry headed off to try to increase our 12th Man Fund in Las Vegas, he left some instructions for me in terms of the Club Secretary duties for a match day. Even by Barry’s very organised standards, I wasn’t expecting a four page document for each role (plus attachments), all colour-coded and in chronological order. According to his list, by 1:45pm I should have been collecting biscuits from the Referees room. Or was it giving them biscuits and taking their expense claims? Of course, Barry had forgotten we had moved the kick off forward to 1pm so I was either 2 hours early or 2 hours late. I’m not sure which. The biggest worry was the fact if I didn’t do something to someone on the Internet at 1pm/3pm then Kellie Discipline, the League Secretary, would be straight on the phone giving me a dressing or a fine. Or perhaps both. Oh, and the fact it said “5:30pm – relax and have a beer” – that was three hours away. So here I am thirty minutes before kick off trying to sort out a kit issue (one of those strange cut-off under socks has gone missing), whilst re-printing forty team sheets that had a big spelling mistake on (Thee Bridges may have been popular in Shakespeare’s time but not today apparently) on a printer that will only allow me to print one at a time due to a cartridge “issue”. Oh and sorting out the play list which has all of a sudden started playing Isabella’s Disney Princess mix from 2008. The phone rings and someone from the local paper wants to come along and watch the game and would like a pass for the 3pm game which he then goes into a panic over when I say it is a 1pm kick off as he has just arrived as “Monkey Biz” with his daughter and “there was no way he could get her out of the ball pool in 15 minutes’. First world problems. A normal pre-match for me involves a pint, chatting with some of my fellow fans, an in-depth discussion with Darren on our opponents and where the strengths/weaknesses are before preparing myself for any tricky names to read out on the team sheet. Today I’m having to find the charger adapter for the substitutes board (The League donated one to each club but when we opened the package it had a European plug on), that should have been on charge an hour ago whilst ensuring that the referees assessor was put on the guest list. I’d already had the dilemma of how to lay out the kit. The home dressing room only has 24 pegs up – we have a squad of 20 arriving, but should the 1-11 get two pegs (one to hang the kit and one for their stuff) or does everyone get one each? I’m mildly concerned that we have two slightly different sets of socks and my OCD kicks in by unravelling every pair to ensure that at least each pair matches. Then there is the TV – it should be showing BT Sports but it has QVC on. The signal comes from the bar, which is currently locked. 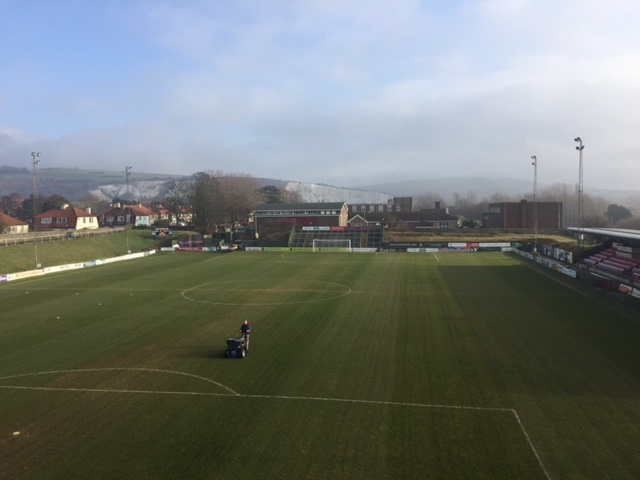 Best of all, our superb Groundsmen have arrived to use a fancy new machine on the pitch but they are unaware it is a 1pm start and so are trying to ride this contraption up and down the grass, avoiding the players now warming up. Sounds like fun? Too right it is. I love being part of the magic that is match day. Huge amounts of work goes into making sure that everyone gets to try to enjoy ninety minutes of football. Whilst we can’t influence the result directly, the preparation that is necessary before every game should be aimed at giving Darren’s side the best opportunity possible to win the match. I started this year sitting in the stands scouting at Peacehaven & Telscombe and would end it clearing up the detritus from the home team bench. That’s the beauty of the game at this level – you make a difference, as too does every other volunteer that gives up their personal time to help the club. So how has 2016 treated us? With all the doom and gloom around in the past few weeks you’d be mistaken to think that our relegation at the end of last season automatically made 2016 a bad year for us. Actually, we probably made more progress this year on and off the pitch that any year in the past five including winning the Sussex Intermediate Cup. 2015 saw us avoid relegation technically on the last day of the season (although events elsewhere meant we couldn’t be relegated even if we had lost to Bury Town on the final day), get hammered in the Sussex Senior Cup Final and then start the 2015/16 season poorly. The first half of the 2015/16 was no better as we started poorly and got worse. It wasn’t until last December that things began to improve on the pitch. Since January performances have been stronger and there is more of a settled feel in the squad as the stats below illustrate. In the previous year we played 50 Ryman League games, gaining just 37 points and conceding a mammoth 93 goals in the process. We won just 10 times, whilst tasted defeat on 33 occasions. It is fair to say that was relegation form. Prior to today’s game we’d played 43 Ryman League games in 2016 and gained 65 points, winning 17 and drawing 14. We had scored 69 goals and conceded 70. If we think back to that period between the start of March and the end of the season where we drew eight out of our ten games, losing just once, what might have happened if we would have not conceded late equalisers (Grays Athletic and VCD Athletic at home anyone?). Extrapolate the 43 games into 46 and we have a 70 point season, enough in recent years to be in the top third of the table. Unbeaten at home since early October, we hoped to finish the year off with a win against a Three Bridges side who have just two wins on the road (although they have been in their last trips away). But football can be as unpredictable as the playlist I had put on before the match. Just because the last two songs have been by the Killers, there’s no guarantee song three will not be something by The Cheeky Girls, or that Apollo 440, lined up as the walk-out song for the two teams actually turns out to be the Jive Bunny. Well, we’d got to the point where the referee had kicked off so we must have got most things right. I checked Football Web Pages and saw that our starting XI was remarkably similar to last week’s, which wasn’t right so had to quickly amend that, not the easiest thing to do on a mobile. Seven minutes gone and The Rooks were in front as Jonté Smith turned in the ball from close range. Five minutes later I remembered that not only did I have to announce the goal but also add it onto Football Web Pages. It wasn’t the best of halves to be honest although we were playing some nice football and never looked under threat. Jamie Brotherton added a second in the 35th minute after a neat exchange of passes with Jonté and we should have had a penalty on the stroke of half-time when Conlon was bundled over. The Lewes side emerged for the second half but there was no sign of our opponents or the officials. The referee, showing that he is human, had not put enough change in the parking meter and so had to dash out to top it up, meaning nobody called the Three Bridges side out. The additional time sat in the warm hardly did them any favours as Ronnie Conlon curled a beauty into the top corner within 46 seconds of the restart to make it 3-0. Game over. The fans in Philcox started singing “You’ve got more bridges than fans”, winning the chant of the year competition. Or not quite. We still have this ability to try to let victory slip out of our fingers. It’s nothing new, especially here at The Pan. Last season we gave up four points in two games by conceding injury time equalisers and all of a sudden in this game it went from 3-0 to 3-2. There was an audible hum of discontent around the ground. If we are to have any thoughts of breaking into the play-offs then we need to be winning games against teams at the wrong end of the table. One magic substitution later and it was all smiles again as Charlie Coppola spanked home a loose ball in the area to make it 4-2. In the two games between these sides this season there have been 14 goals. Undoubtedly there could have been half a dozen more had it not been for the fine form of former Rook Kieron Thorp in the Three Bridges goal who kept the scoreline respectable in the final ten minutes. At the final whistle I can enjoy that long overdue pint. 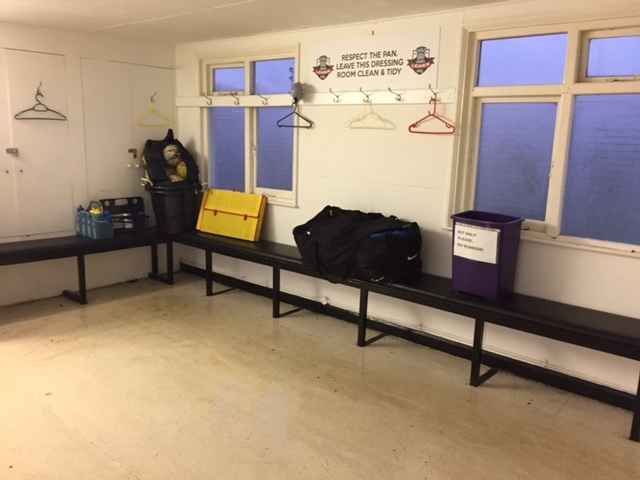 Alas it is not for relaxation – I just need to wait for the players to get changed so I can start sorting the kit and cleaning the dressing room so that come 1pm on Monday when they walk back in for the game against Horsham. I’m not sure that 20 individuals could purposely make more mess if they tried. With a game on Monday there would be no time for our usual kit washing or dressing room cleaning routine. Duncan (Ops Manager) and I grabbed the brooms, buckets and mops and got to work whilst Jane (Director) picked up the kit to deliver to Carol (Director) to wash and dry all of the kit – the happiest of happy new year eve’s I’m sure with 21 shirts, 22 pairs of shorts (not quite sure why there were more shorts than shirts! ), 22 pairs of socks, 11 pairs of cut-off socks, 24 warm up t-shirts, 18 warm up jacket and a random pair of Pringle pants for company as Big Ben struck twelve. I’d read earlier in the day that the reason why it was a 1pm kick off was so that the directors had time to get ready before going up to London. I wish that was the case. The two hours we gave everyone back to enjoy the last night of the year was taken up for me by cleaning and then sitting in a traffic jam on the M25. Did I mind? Not one bit. The afternoon summed up all that was good with the club. I’m sure a few will grumble about the queue for food (a solution is in the pipe, or should I say pie, line) whereas I heard of a few others who missed the game because they didn’t know it was a 1pm kick off despite us promoting it through every available channel. But a team effort on and off the pitch saw us end 2016 with three points and a smile on everyone’s faces.